Deceptor is an Enemy in Lords of the Fallen. Enemies are hostile creatures and humans that Harkyn encounters throughout the game. They have different resistances and drops, sometimes leaving behind powerful Weapons. 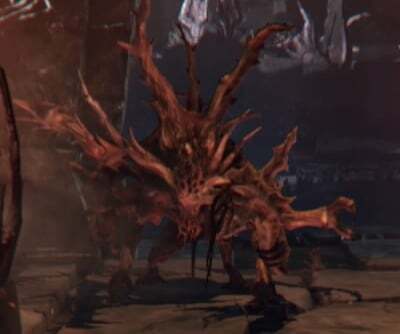 Deceptors are some of the more animalistic enemy types that are found in Lords of the Fallen. Generally they will tend to stick around Rhogar Beastmasters however due to their massive size and wide variety of attacks they can be just as difficult of a challenge when fought alone. General - Typically the best approach is to let them launch towards you first, roll out of the way and attack them. Once at close combat it's best to wait until they initiate an attack against you, once they've done this attack them on their side or back.